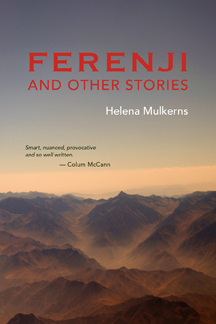 Ferenji and other stories by Helena Mulkerns, from Doire Press, is a themed short fiction collection set among civilians in conflict and post-conflict zones. Inspiration comes partly from the author’s personal experience and research completed while working in Central America, Africa and Afghanistan. The story Dogs was shortlisted for the 2017 Bórd Gais Irish Book Awards. She has also been shortlisted for the Hennessy New Irish Writing Awards, America’s Pushcart Prize and Ireland’s Francis MacManus Short Story Award. She received a bursary from the Arts Council of Ireland to work on FERENJI. Publicity for the book’s release is handled by Cormac Kinsella and the book’s media coverage included a glowing IRISH TIMES review, a HOT PRESS interview, an ARENA interview, and a HOT PRESS book review, a column in THE SUNDAY TIMES ‘Reprisal’, one of the book’s short stories, has been published on the IRISH TIMES.com website. In the “Best Books of 2016” feature, author Nuala O’Connor (“Miss Emily”) cited Ferenji as one of her favourite books. In THE IRISH INDEPENDENT “Writers Favourite Books of 2016” feature, Dermot Bolger also named “Ferenji” as one of his favourites. Sue Leonard in the IRISH EXAMINER has described the book as “a quite wonderful collection.” Elsewhere, Helena has written and several other media features and reviews are forthcoming. Author Orla MacAlinden also named it one of her faves in 2017, and you can see the most recent review of the book here. See the Ferenji BOOK TRAILER here. Ferenji depicts life in the field — warts and all — with pathos, dark field humour and satire, lending a passionate civilian voice to the new genre of contemporary post-conflict literature. In ‘A Child Called Peace’, two young Irish peacekeepers find a child dying in a minefield. In ‘Blood and Bone’ a war photographer is haunted by the image of a refugee. “Dogs” explores how sexism can go beyond culture and borders. The title story, ‘Ferenji’ pits a lone aid worker against a bureaucratic system and ‘Operation Cat Lift’ is an allegory for our times. The author was a music and arts journalist in Paris and New York before working for the UN and has edited two literary anthologies, including Red Lamp Black Piano. She is also an experienced speaker and performer, available for events and interviews. Doire Press is an award-winning literary publishing house located in Connemara, Co Galway. Ferenji and other stories will be available in bookshops around Ireland, and from Doire Press.